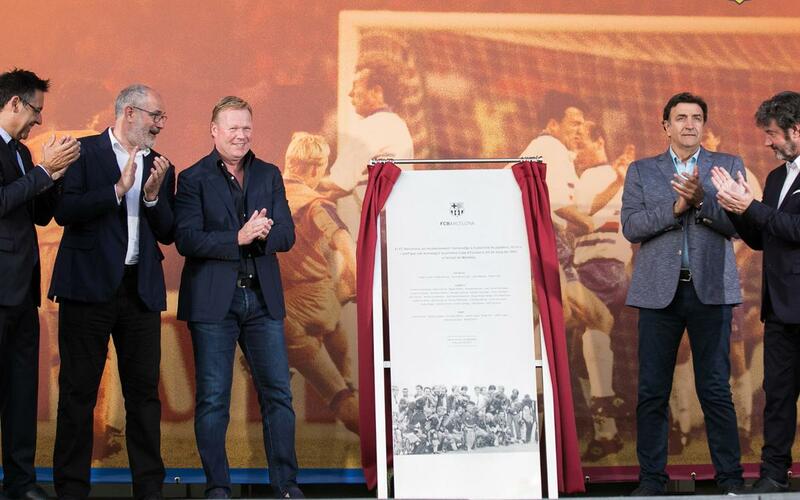 FC Barcelona continued its tribute to the heroes of Wembley 92 on Friday by unveiling a plaque at the Camp Nou to commemorate the club’s first European Cup, 25 years ago. President Josep Maria Bartomeu was joined by the four captains of the team that season, Zubizarreta, Alexanko, Bakero and Koeman, along with other members of the playing and coaching staff from the era and, naturally, plenty of representatives of the local and international media. There was no red carpet for the heroes. Instead, it was an orange carpet that welcomed the Wembley 1992 stars, in honour of the jersey that the team wore that glorious night in the British capital. It led them to gate 15 to the grandstand, where the special guests all posed together before the commemorative plaque to mark the event on the stadium façade. The group then made their way to the Roma 2009 lounge at the Camp Nou for dinner. The showpiece event of the weekend comes on Saturday with a fan zone open all day on the stadium forecourt to be followed by a 7-a-side match on the Camp Nou turf between the heroes of Wembley 92 and a team of Benfica veterans.